Reading skills are the foundation of almost every subject in school. Children having a strong reading ability will enable them to succeed in other subjects, and it includes even further life benefits that you might not expect. Another study by Oxford University found “that there was a 39 percent probability that girls would be in professional or managerial posts at 33 if they had read books at 16, but only a 25 percent chance if they had not. For boys, the figures rose from 48 percent to 58 percent if they read books.” That shows a 14% increase for girls and 10% for boys, showing that reading has a genuine effect on the quality of children’s lives. What you find from many children is that they aren’t interested in reading until they really find something that interests them. Consider what interests your child has, and then try to find books related to that. For example, if your child is interested in football, there are a great number of football stories out there, some even written by actual footballers. Children lead by example – if they see parents reading frequently at home then they are far more likely to become independent readers. Perhaps you can set a target for ‘Number of books read in a month/year’, with a reward promised at the end. Set aside an hour of the day for reading and ensure that nothing else happens in this time. Turn the television off, confiscate games consoles if you need to because the time needs to be 100% focused. If you, as a parent, also read during this time, then it will not seem “unfair”, but rather like a joint activity. As educators and parents, we need to understand that there is a difference between being able to say words out loud and being able to understand the meaning behind them. Reading operates on two levels, processing the words and saying them aloud, and the deeper level of comprehension. In the first step, it is very clear to adults when children are successful. We can hear when they are pronouncing words correctly and reading clearly and fluently, and it would be easy to assume that if children can read the words, that they understand the words and meaning. This is not the case. This second level is reading comprehension, which means the understanding of the text. On the most basic level, this refers to children understanding the meaning of the individual words they read. However, there are deeper levels of understanding. If we’re reading fiction stories, we can consider deeper things like characters’ motivations, their emotions and much more. There are a few different areas of Reading Comprehension that can help us to understand it. Seeing if the child is able to make reasonable predictions about what might happen next. An effective prediction will be based on facts from the story, such as characters past actions and personalities. An ineffective one will be unrelated to events from the story. Asking questions about the text. For example, this could be a question about why a character is doing something unexplained, or where the story is located. Asking these questions helps children process what they know and what they don’t yet know. If they write these down, they can then answer them as they read further through the book. Summarising is an invaluable skill for children; when they summarise writing they scan their understanding of it, choose relevant information and communicate what they think has been happening. If children are unable to summarise effectively, it shows their comprehension of the text is low. Mid-level summarising is when a child can tell the events of a story back to you, but also gives other information that is not relevant. Children that can effectively summarise are able to select relevant information and ignore irrelevant information. Summarising should be done first over small selections, such as one page or two pages. When children can recall this, it should become more complex. Can you summarise what happened in this chapter? Can you summarise the book so far? 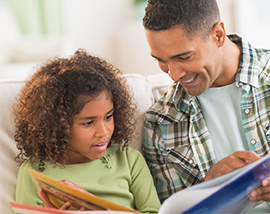 Show an active interest in your child’s reading. Ask questions. Dedicate a set time for reading. One hour a day is a good time. Use the ideas of Summarising, Inferring and Predicting to base your questions around. Read frequently yourself. Show that reading is enjoyable and children will copy. Read aloud to your children before bed. This way they can experience more advanced texts. Reinforce good reading. Congratulate children and recognise their efforts.